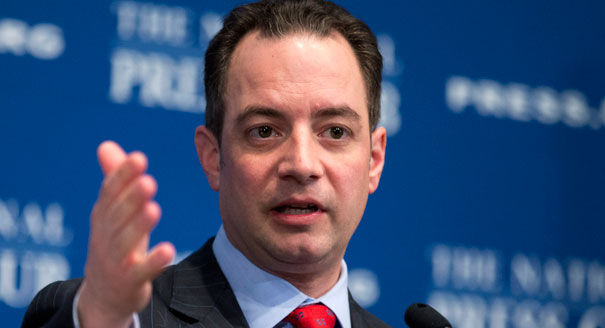 Reince Priebus has done a surprisingly good job keeping himself in the news. The Republican National Committee chair recently gained widespread coverage for his threat to end Republican primary debates on CNN and NBC unless both networks pulled support for a Hillary Clinton documentary in the works. The RNC officially voted on and approved the measure earlier this month, marking a major victory for Priebus’ plan to reform the primary process. As a result, he’s seen a big uptick in his national and beltway media coverage in the past month. At first the news numbers don’t seem especially impressive for the head of the RNC, but the committee heads rarely get much dedicated media attention. 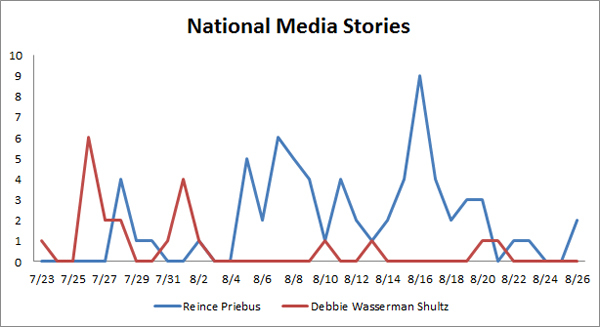 For comparison, here’s national news stories on Priebus vs Debbie Wasserman Schultz, chair of the Democratic National Committee. The big jump at the end of July came from Wasserman Schultz’s call for San Diego Mayor Bob Filner to resign. Beyond that, there’s been little movement for her either way. 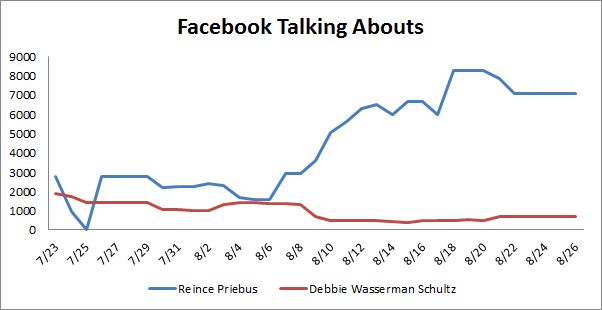 The same pattern can be found on Facebook talking abouts, where Priebus has much more activity. It’s an open question how much the discrepancy in national presence matters for the heads of the respective committees. Although the RNC has outraised the DNC every month this year and the DNC is significantly in debt, it’s possible that Democrats may just be giving their money differently. Organizing For Action, a pro-Obama political group, has already raised more than $10 million this year. And the Democrat’s Congressional and the Senatorial campaign committees both outraised their Republican counterparts. Either way, Priebus’ actions have gotten a lot of buzz. And whether or not different parties give differently, he’s been effective in getting money to his organization. We’ll be keeping an eye on Preibus’ metrics to see how they change in the aftermath of his debate efforts. Former Vice President Al Gore is still raising public awareness on global warming, even if he doesn’t quite get the facts straight every time. This week Gore continued his efforts to bring climate change to the forefront of political debate ahead of a UN report which claims human agency as the cause of rising temperatures. In an interview with the Washington Post, Gore said that “man-made global warming is all over” storms like hurricanes and other extreme weather events. “The extreme events are more extreme. The hurricane scale used to be 1-5 and now they’re adding a 6,” he said. 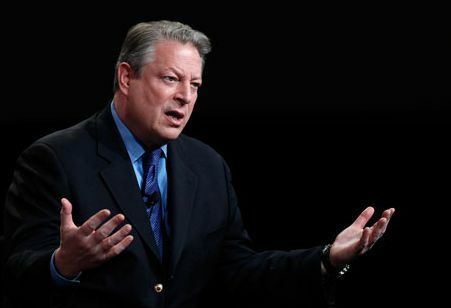 But according to Gretchen Goldman, an analyst in the Scientific Integrity Initiative at the Union of Concerned Scientists’ Center for Science and Democracy, Gore’s comments weren’t completely accurate. Both Goldman and a spokesman for the National Weather Service have said that there are no plans to add a Category 6 to the Hurricane scale. A little hyperbole, perhaps. Note: He also compared climate-change denial to racism and homophobia in the interview. Since his 2006 film An Inconvenient Truth, Gore has been seen as a major activist on climate issues, but his involvement in the issue has also spurred political divides between Democrats and Republicans. This week his comments on climate change and climate denial drew ire from Republicans. We took a look at how much buzz Al Gore generates on social media when climate change issues are trending in the news. There appears to be a clear correlation between mentions of climate change in the media and Facebook “Talked Abouts” for Gore. Not only has he seen an upsurge this past week in Talked Abouts following the UN report and his interview, but he also saw major upticks in June. Here’s why: in mid-June, the Bloomberg administration issued new warnings about New York City’s vulnerability to climate change. And again in late June, a study backed by NASA and the EU showed that Greenland was losing ice five times faster than it was in the 1990s. But while Gore has been in the press a lot recently for his comments about human impact on climate change, his message seems to have lost credibility more recently—he’s seeing less Facebook Likes this month than he did back in June. Since his comments in the Ezra Klein article were published, he hasn’t seen significant gains in in Likes– especially compared to his Talked Abouts rate. Will he still have influence on this issue in the wake of the criticism he’s received? Coincidentally, House Republicans scheduled a hearing for next month on climate change, in a move that some say seems to be calling the Democrats’ bluff. We’ll continue to monitor this issue as the climate debate warms up. When Hillary Clinton launched herself back into the public eye this spring, it seemed her biggest liability might be her handling of Benghazi while she was Secretary of State, but then the Anthony Weiner campaign happened. The Weiner drama has not only entangled one of Clinton’s closest advisers, Weiner’s wife Huma Abedin, but has also reminded the public of the Clintons’ own scandalous past. After a month of news coverage that centered on how Clinton’s camp was handling the media blitz with regard to new revelations in Weiner’s online sexting scandal, the coverage of mismanagement at the Clinton Foundation has also been intense, although not nearly as frequent. There’s no question it’s been a tough month for Clinton in terms of press, but is it really anything new? Even Clinton’s 2008 campaign was plagued by infighting, finger pointing and scandal. The former Secretary of State has seen a decline in Facebook “Talked Abouts” since the revelations about Anthony Weiner emerged in late July. This could be read in different ways—either Facebook users are weary of the incessant drama that seems to follow Clinton or they’re willing to pass off the Weiner scandal as out of Clinton’s control. Clinton allies say the potential 2016 presidential candidate has learned from her 2008 campaign and managed the current crisis from afar, distancing herself from Weiner while still quietly supporting Abedin. But her critics paint a different picture—they claim that the drama and infighting that seems to follow Clinton has put her all over the tabloids instead of in the middle of substantive political debates. This could be one reason Clinton has begun to speak out on key policy issues recently. So is Clinton surviving the negative press this time around? 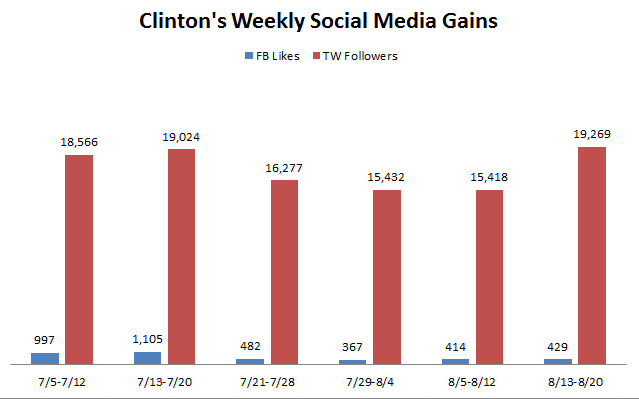 Clinton’s social followings took a hit in July amid the Weiner press coverage. But her Twitter following seems to have rebounded to its pre-scandal weekly gains since last week when she saw an uptick of almost 4,000 more Followers than the week before. 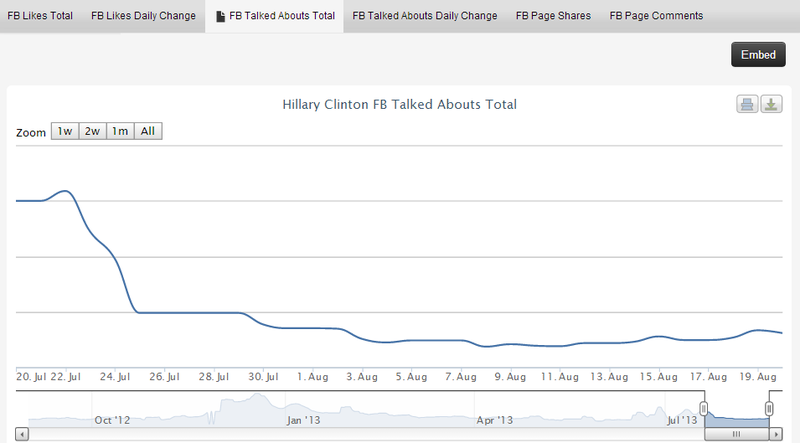 Her Facebook Likes have not done the same and remain at about half of what they were before the negative press on Weiner hit. They say all publicity is good publicity; we’ll see if the old adage holds up when it comes to how Clinton’s public image resonates on social media. As presidential wannabes flock to Iowa this summer to start testing the waters and make inroads in the Hawkeye state, the big question lingers–who stands a chance against the formidable Clinton machine? 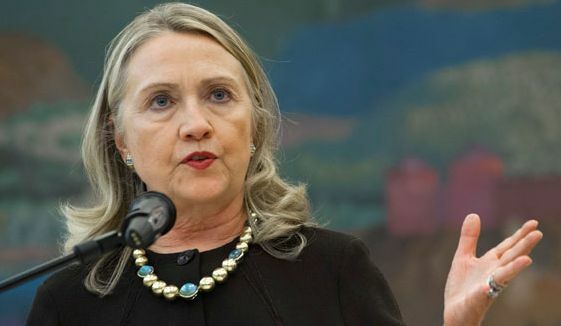 The possible list of GOP presidential candidates continues to grow, but it seems Hillary Clinton has temporarily frozen the field for Democrats in 2016 until she formally announces whether she’ll run. 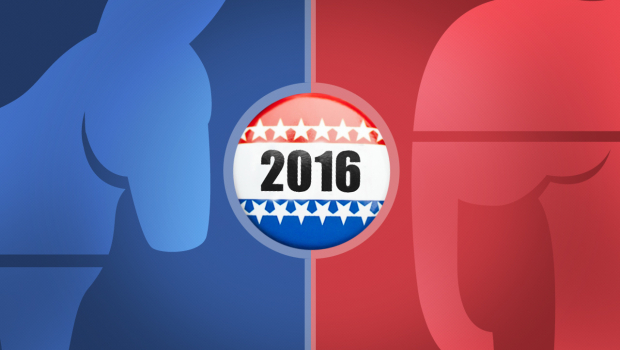 We’re still over 2 years away from Election Day and no one on either side has begun to lay the groundwork for a presidential campaign, but it’s never too early to see who is generating the most online buzz among some possible contenders. Vice President Joe Biden, San Antonio Mayor Julian Castro, and Minnesota Senator Amy Klochubar will all be making trips to Iowa this summer amid speculation that they are mulling presidential bids. Fun fact: In 2006, then-Senator Barack Obama also made the trek to Iowa, long before he received the Democrat nomination in 2007. Newark Mayor Cory Booker handily won the New Jersey Senate primary last week and many believe that if he makes it to the US Senate, he will consider a presidential run in 2016. Then there’s Maryland Governor Martin O’Malley who has been the most candid about his presidential aspirations to date. He announced at the National Governor Association meeting earlier this month that he intends to continue to the lay the groundwork for a presidential bid by fundraising and beefing up his social media presence. 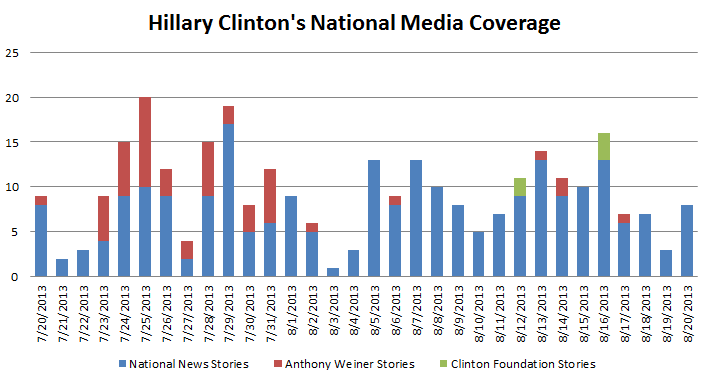 When it comes to media coverage, no one comes close to the amount of media buzz that Clinton has generated. It seems that the media hasn’t stopped speculating about the former Secretary of State. Biden has about half as much national media coverage as Clinton and he’s second in command! After Biden, the media coverage drops off considerably for the remaining Democrats. Booker has less than a fourth of the Vice President’s media coverage—even with a recent primary win. When it comes to social media, it’s a different story. Booker, known for his social media prowess, has the largest following on Twitter of any of the possible contenders—he’s accrued twice as many followers as Clinton. Biden has the most Facebook Likes of the Democrats we’ve selected. Booker was the most “talked about” on Facebook over the past week—probably due to his recent primary victory. Castro was the second most talked about is the past week after he announced he would attend the infamous Iowa Steak Fry, indicating the mayor is capable of generating a lot of buzz. Interestingly, Clinton was the least buzzed about in the past week indicating that Facebook users may be losing interest until she makes an official announcement. So it seems the national media has a clear favorite in Hillary Clinton, but social media has yet to decide a clear contender. What’s interesting is that these potential candidates seem to be buzzing in different ways—we’ll keep watching as the race for the 2016 Democratic nomination—er running mate— heats up. Mike Duggan pulled off an unexpected victory in yesterday’s primary for Detroit Mayor, getting 46% of the vote through a write-in campaign. 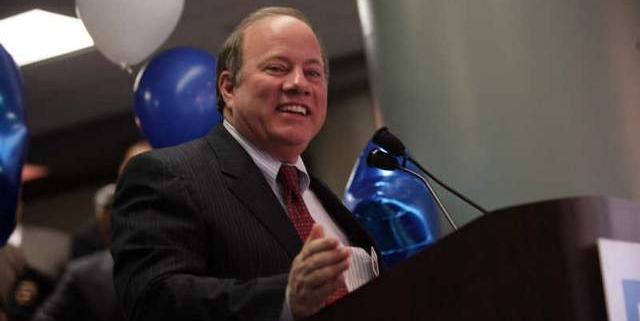 Duggan went from a well-positioned candidate to underdog after his name was taken off the ballot on a technicality in June, forcing him to rely on write-ins to progress in the primary. Duggan’s campaign has gotten intense media attention on the state level, frequently surpassing Governor Rick Snyder and current Detroit Mayor Dave Bing. The only Michigan state-level politician with more coverage is Detroit Emergency Manager Kevyn Orr. The dismal coverage of Mayor Bing, which we covered in a previous blog post, is mostly attributable to Detroit’s emergency manager Kevyn Orr. Since the announcement of an emergency manager last March, the city government has played an increasingly small role in managing Detroit, leading to less coverage. On the flipside, Orr has recently become the major political figure in the state – an unusual position for an unelected politician. One of the big questions in this election is what role the next Mayor will have vis a vis Kevyn Orr. Coverage of Duggan has moved roughly in consort with Orr – we’ll be keeping an eye on whether he can decouple his state coverage, implying a return of power and influence to city government. 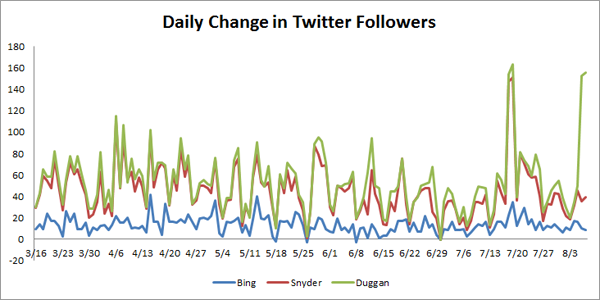 The same trend can be seen in changes in Twitter followers and discussions on Facebook, where Mike Duggan has been making impressive gains. 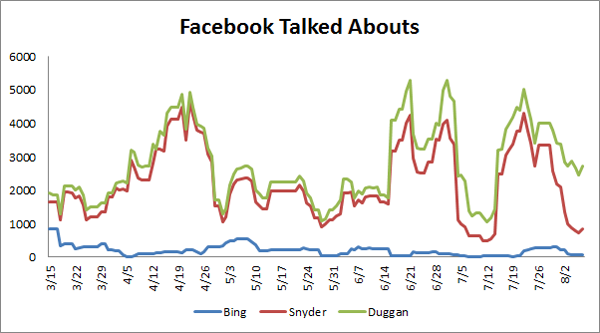 Although still below Snyder in total Twitter followers and Facebook “talked abouts”, he’s growing at a fast rate – especially since his primary victory. The jump in Duggan’s social media presence could potentially lead to increased out of state interest in his candidacy, opening new fundraising opportunities. Thanks to national coverage of the Detroit Bankruptcy, the Mayoral race has the potential to get widespread attention outside of the State. Utilizing social media is one avenue to channeling his coverage into donations. He has already raised more than $1 million so far, compared to his opponent Benny Napoleon who has so far raised just north of $600,000. Mike Duggan’s candidacy is a demonstration of increasing viability for write-in candidates, such as Lisa Murkowski, Alaska’s current Senior Senator. We expect social media to open new doors for public engagement; while being the write-in candidate is never an easy path to victory, it’s becoming increasingly possible.